I have lost count of the number of times people have looked at my three energetic boys and exclaimed “I don’t know how you cope!” Although I find this sort of comment odd for many reasons, I understand that what they are really wondering is how I keep up with three boys. Over the past seven years I have learnt that it less about me keeping up with them and more about wearing them out! Author Missy Chase Lapine has put together Sneaky Fitness, a guide to slipping exercise into children’s everyday routines. Lapine recognised that for many children ‘play’ was happening in front of a screen rather than in the backyard. At the same time, increasing homework loads and children grabbing moments of ‘down time’ in front of the television in their otherwise hectic schedules has added up to “a lot of sitting”. As a result, children aren’t learning the benefits of exercise – more energy and strength, improved brain power, a boost to self-esteem and the obvious health benefits such as warding off obesity, heart disease and diabetes. Plus it’s fun. Sneaky Fitness presents all sorts of exercise ideas for different age groups. Each ‘exercise’ is designed to incorporate cardio, strength training and flexibility into everyday routines. The activities are simple and inexpensive and more often than not will seem like a game to children. For example, there’s driveway ‘hockey’ played with a giant ice cube and brooms (my boys would think that was fabulous) and simple suggestions for getting preschoolers more active with a bucket, spade and piles of dirt or sand. Not all of the suggestions are games or require equipment. For instance, Lapine suggests that if kids have mobile phones they must walk around the house when using them – no sitting for long chats with friends. Lapine is also the ‘sneak’ behind the bestselling cookbook The Sneaky Chef which looks at ways of adding healthy foods into children’s diets. Sneaky Fitness also includes recipes for fuelling active kids. 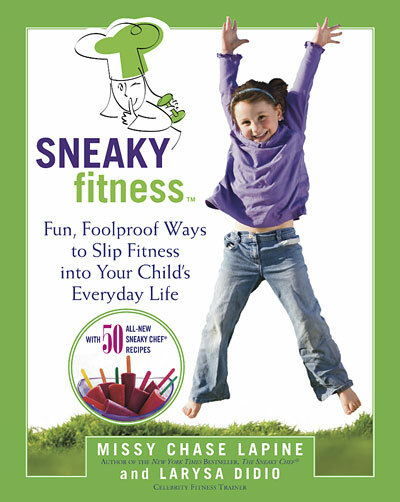 Given growing concerns about childhood obesity, books like Sneaky Fitness provide a great resource for parents looking to put more spring in every step. Sneaky Fitness is available from Fishpond for $26.97.